When a business owner dies or leaves a company unexpectedly, disagreements among the remaining owners and outside parties, such as a deceased owner’s heirs, pose a threat to its financial health and continued existence. A buy-sell agreement can help mitigate such risk. A buy-sell agreement is a legal document that gives parties the right or obligation to buy shares when a “triggering event” occurs. These events include an owner’s death, disability, divorce, termination of employment or withdrawal from the business. Properly structured, the agreement limits ownership and control of the business to a select group such as co-owners, family members or members of management. This helps prevent the company from falling into the “wrong” hands — for example, those of an owner’s creditors or former spouse. Buy-sell agreements essentially help create markets for what might otherwise be unmarketable assets. Unfortunately, the value of shares in a privately owned company isn’t as immediately apparent as it is with publicly traded shares. So a buy-sell agreement needs to specify the value of ownership interests — or provide a methodology for calculating value when a triggering event occurs. To help ensure such values will hold up to any legal challenges, engage a professional business valuator to make an initial appraisal, as well as periodic re-appraisals of your company. You want the agreement’s pricing terms to be as precise and unambiguous as possible so they aren’t misinterpreted later on. One important role of many buy-sell agreements is to provide liquidity so that a departing owner’s business partners can afford to buy back shares. To make such liquidity possible, you’ll need to “fund” your buy-sell agreement. If your company is cash-rich and confident in its ability to remain so, you could use reserves. However, life insurance generally is a more accessible and less risky solution for funding a buy-sell agreement. In addition to providing liquidity for remaining owners, life insurance proceeds can help a deceased owner’s heirs pay estate taxes. (See the sidebar “Stay on top of estate tax changes.”) The value of a life insurance policy also might provide liquidity for an owner who retires or becomes disabled. A properly funded buy-sell agreement can provide liquidity to your heirs so they aren’t forced to sell interests in your business to meet estate tax and other obligations after your death. To ensure your agreement is adequately funded for such a purpose, keep an eye on tax laws and inflation adjustments. Currently, the top rate for the gift, estate and generation-skipping transfer (GST) taxes is 40%. However, the 2014 exemption amount for gift, estate and GST taxes is a relatively high $5.34 million. This exemption is annually indexed for inflation, so be sure to regularly review the value of your business interests and adjust your buy-sell agreement’s funding accordingly. Business vehicles: Buy, finance or lease? Whether you need a single 4-door sedan or an entire fleet of 14-wheelers, how you acquire vehicles for business use has tax consequences. In most cases, you’ll have one of three options: purchase outright, finance or lease. If you can spare the cash, buying is a good option. It allows you to avoid finance charges and control resale pricing. Plus, purchased vehicles generally qualify for depreciation deductions. Depending on the type and cost of the vehicle, you may benefit from a Section 179 deduction — which enables you to write off the cost (up to an annual limit) of a vehicle in the year you place it into service. Financed purchases also generally qualify for tax breaks and allow you to invest available cash in other, potentially higher-returning, initiatives. Leased vehicles don’t qualify for depreciation or Sec. 179 expensing. However, you typically can deduct the business percentage of your lease payments, as well as gas and maintenance costs. And, in many states, you’ll pay sales tax only on monthly lease payments — not on the full purchase price of the vehicle. Donating to charity makes it possible to do good and do well. But to claim an income tax deduction or reduce the size of your taxable estate with charitable gifts, you must follow IRS rules carefully. First, ensure that you’re donating to a qualified charity. There are thousands of organizations soliciting contributions, many with similar missions and names, so it can be easy to confuse a legitimate charity with an unqualified or even a fraudulent one. Watchdog groups — for example, Charity Navigator and CharityWatch — provide information on many nonprofit organizations. They rate them based on such qualities as transparency and fiscal responsibility. Keep in mind that nonprofits that were once qualified could lose their tax-exempt status due to noncompliance. A current database of qualified charities is found on the IRS website. Many donations to qualified charities, such as cash gifts, are fully deductible if you have proper records. Others are only partially deductible. If, for example, you do volunteer work, you may deduct only your out-of-pocket expenses, not the fair market value of your services. And if you donate tangible personal property that isn’t related to the charity’s primary function, your deduction is limited to your “basis” in the property — generally what you paid for it. Also know that, if you receive an in-kind benefit for your donation, such as merchandise or a meal, you can deduct only the amount that exceeds the fair market value of that benefit. Good record-keeping is critical. For any contribution of $250 or more, keep on file a bank or payroll deduction record documenting the contribution, as well as a contemporaneous written communication from the charity stating its name, the amount and date of your contribution, and the value of any goods or services you received in conjunction with your contribution. For substantial donations — such as an item valued at more than $5,000 — you must submit an additional tax form and obtain a professional appraisal of the property. To ensure your gift qualifies and that you’re receiving the full allowable deduction, work with your tax advisor when making major gifts. Charitable gifts also can help you reduce gift and estate taxes. But before you make a charity part of your estate plan, consider your own lifetime income needs and what you want to leave your heirs. Two types of trusts are designed to help people make tax-advantaged charitable gifts. With a charitable lead trust, you can make charitable gifts during your lifetime and preserve assets for your heirs to be paid out after your death. With a charitable remainder trust, you can elect to receive regular income payments during your lifetime and leave the trust’s remaining assets to charity when you die. Setting up and maintaining a charitable trust is complicated. So be sure to work with experienced estate and tax planning experts. As several recent high-profile security breaches have taught consumers, credit and debit cards are never entirely safe from thieves. Fortunately, if your physical card — or account information — is stolen, you aren’t likely to be liable for most fraudulent transactions. However, liability rules can vary by card type and when you report the theft. According to the Federal Trade Commission, if your physical credit card is lost or stolen and you report the loss before it’s used in a fraudulent transaction, your card issuer can’t hold you responsible for unauthorized charges. However, you may be responsible for up to $50 in fraudulent charges if you don’t report the card loss until after a thief has used it. The rules governing debit cards are a little different. If you report a missing debit card before any unauthorized transactions are made, you aren’t responsible for them. And if you report a card loss within two business days after you learn of the loss, your maximum liability is $50. However, if you report the missing card after two business days but within 60 calendar days of the date your statement showing an unauthorized transaction was mailed, liability can jump to $500. Worse, if you report the card loss more than 60 calendar days after your statement showing unauthorized transactions was mailed, you could be liable for all of the funds taken from your account. What if you notice an unauthorized debit card transaction on your statement, but your card is still in your possession? In that case, you have 60 calendar days after the statement showing the unauthorized transaction is mailed to report it and avoid liability. Lower liability protections on debit cards may make you wonder if you’re safer using a credit card. Keep in mind that some debit card companies offer protections that go above what the law requires. For example, your issuer may waive charges if your account is in good standing and you’ve exercised reasonable care in safeguarding your card. Finally, if you’re liable for fraudulent charges, check your homeowners insurance policy. Some policies cover liabilities incurred when credit and debit cards are stolen. The best time to start recording information about a fixed asset is while you’re creating a transaction related to its purchase. 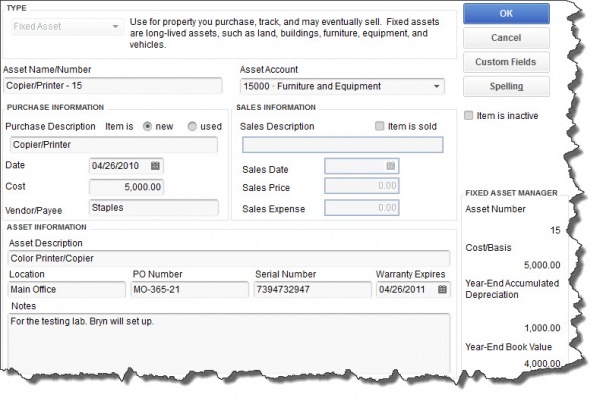 You can build an item record for it as you’re filling out theItem section of Enter Bills, Write Checks, Enter Credit Card Charges or Purchase Order. 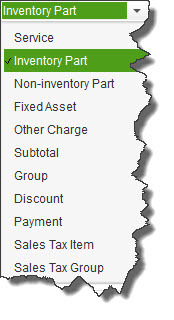 Under ASSET INFORMATION, enter the Asset Description (you can write a lengthier description here), its Location, PO Number if applicable, Serial Number and warranty expiration date. AddNotes if you’d like, and you’re done – unless you want to incorporate Custom Fields. If so, click the Custom Fields button in the upper right, then Define Fields. This can be a little tricky, contact us if you have questions.